Eye Love Wednesday - impactful liners from Kat Von D, Make Up For Ever and mark.! Kat Von D Lightning Liner - $25 - in 6 fun, richly pigmented metallic shades: Jett - balck with silver shimmer, Hyde - deep brown with bronze shimmer, Fyfe - khaki green with gold shimmer, Hex - deep burgundy with plum shimmer, Juno - forest green with emerald shimmer, Poe - purple with violet shimmer - with a precision brush tip with fine, flexible fibers that glide across the lash line depositing just the right amount of product for precise fluid application in a click pen that ensures that the product is always fresh and never dry. Make Up For Ever Artist Liner - $23 - a super-slim, ultraglide pencil in 15 vivid shades with matte, metallic, iridescent and diamond finishes: Matte Black, Diamond Black, Matte Anthracite Grey, Iridescent Taupe Grey, Matte Navy Blue, Iridescent Turquoise, Matte Majorelle Blue, Iridescent Khaki, Iridescent Pop Green, Iridescent Tree Green, Matte Bright Brown, Matte Dark Brown, Metallic Bronze, Matte Plum, Iridescent Purple - with an ultracreamy, highly pigmented formula that is incredibly easy to apply and provides intense color payoff for long-lasting definition that stays put. Featuring a twist-up pencil with a super-slim tip, Artist Liner allows for precise application without the hassle of sharpening. Use it to apply ultrafine lines or smudge it out for a smoky effect. Available at Sephora, sephora.ca and Make Up For Ever boutiques. mark. 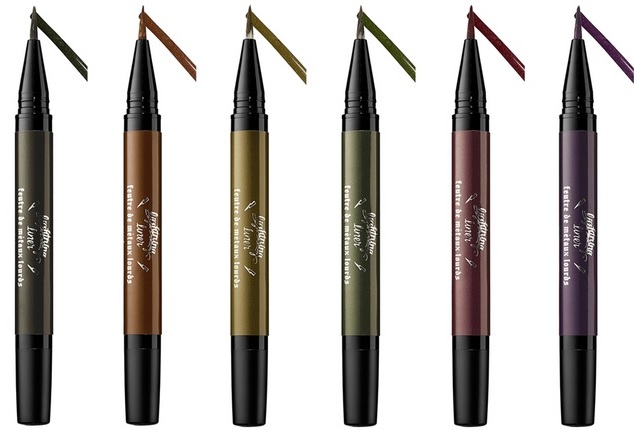 Waterproof What A Line Max Liquid Eyeliner - $12 - in 6 richly pigmented shades - 2 matte: Black and Electric Cobalt; and 4 shimmer: Steely Gleam, Chocolate Gleam, Forest Gleam and Plum Gleam - with a precision-tip foam applicator that allows you to create a fine or thick line and a waterproof formula that lasts all day long without smudging.